I will finish the design and probably applique them onto a background fabric. I love Sue's book (reviewed here) and can't wait to make some of the patterns. I have many of her templates and just had the idea of having my boys trace them onto paper for me - great Summer project for them, don't you think? Hexagons are fun. I wonder if I will ever make one of those grandmother garden quilts... 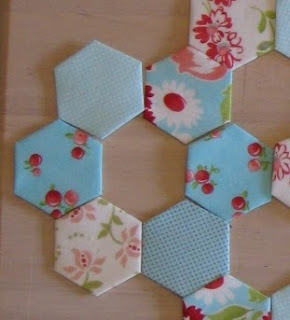 So many hexies to sew together! Of course, I could also teach the boys to do it to keep their hands busy and from punching one another (this has been an eventful Summer so far, with a 13- and a 12-year-old at home!). This year I`m playing with them too. Olá! a quanto tempo....Sou viciada nisso,adoro.Faço os meus de revistas e catálogos da Hering,são papéis firmes,Não uso cola e nem prendo com alinhavos.Faço pelo avesso,e em cada dobra um ponto de arremate,depois é só retirar os papéis e o alinhavo fica no avesso,menos trabalho em retiradas de linha e sem furar o papel.Já fiz tantas colchas e almofadas que já perdi as contas,houve um tempo que contaram (minhas filhas)2300 de todas as cores e tamanhos.Ensine os seus filhos eles vão gostar,pode fazer de tudo com hexágonos,é só seguir gráficos de ponto cruz,é bem legal.Deus te abençoe. That happens to my hexies some time. I just put a little dab of glue on the corner and continue on. Yours are so pretty. Hexies are so flexible.